For years, the disappearance of the McStay family from their San Diego County home puzzled investigators, with no signs of forced entry and the couple's credit cards untouched. After their remains were found years later in a remote desert location more than 100 miles (161 kilometers) away, authorities charged a Southern California man with the killings, alleging he bludgeoned his business partner, partner's wife and two young sons with a sledgehammer before burying them. Now, 61-year-old Charles "Chase" Merritt is facing trial in the murder of Joseph McStay, McStay's wife Summer, and their 3- and 4-year-old boys. Opening statements are expected Monday in San Bernardino County, where the family's remains were found. Authorities have said Merritt's cellphone was traced to the remote gravesites and to a call days later seeking to close out his then-missing business partner's online bookkeeping account. They also have said Merritt's DNA was discovered on the steering wheel and gearshift of McStay's SUV, which was impounded near the Mexican border a few days after the family vanished. Defense attorney James McGee said that DNA could have been transferred to the vehicle by McStay after he met with Merritt shortly before the family vanished. McGee also said none of Merritt's DNA was found at the gravesites but DNA belonging to other unidentified individuals had turned up there. "From the evidence the government is going to present, our argument is going to be: You had the wrong guy," McGee said. Britt Imes, supervising deputy district attorney for San Bernardino County, said he could not comment on ongoing cases. 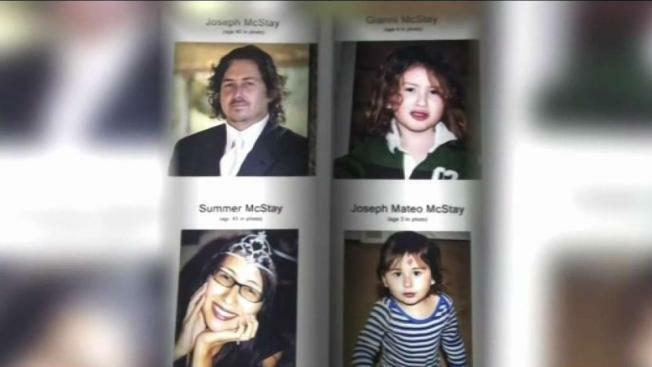 The McStay family disappeared from their home in Fallbrook, which is about 50 miles (80 km) north of San Diego, in 2010. Their remains were found in San Bernardino County in 2013 along with a 3-pound (1.4-kilogram) sledgehammer and a child's pants and diaper. Authorities have said all four victims were believed to have been killed by blunt force trauma to the head. Investigators have said they spoke with Merritt shortly after the family went missing and noticed he referred to them in the past tense. They also have said a customer service representative told them he received a call about McStay's QuickBooks account, which he used to pay vendors connected to his water features business, after he vanished. The call, according to authorities, was placed from Merritt's cellphone. For a timeline of McStay family murder mystery, click here.